There’s often a gap between the theoretical knowledge you gain during your schooling and the practical experience that jobs demand. Internships serve as bridges that close this gap by offering hands-on training while helping you expand your skill set and grow your professional network. Landing a UX design internship isn’t easy, though. It requires time and preparation to find the right role to help you launch your UX design career. 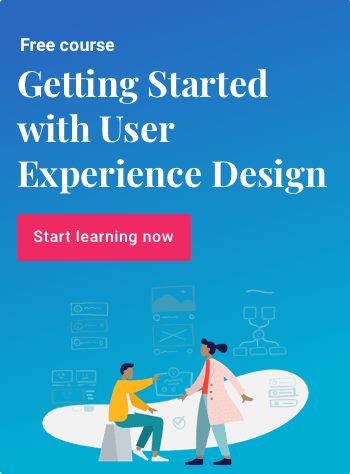 To score a UX design internship, you’ll need to load your UX design arsenal with attractive soft skills, extensive foundational learning, and other weapons we’ll discuss later. You’ll also need to up your networking game, optimize your resume, and have a strategy in place to stay on top of new openings. Additionally, you’ll want to ask yourself a few questions to understand which internships will be most suitable for you. 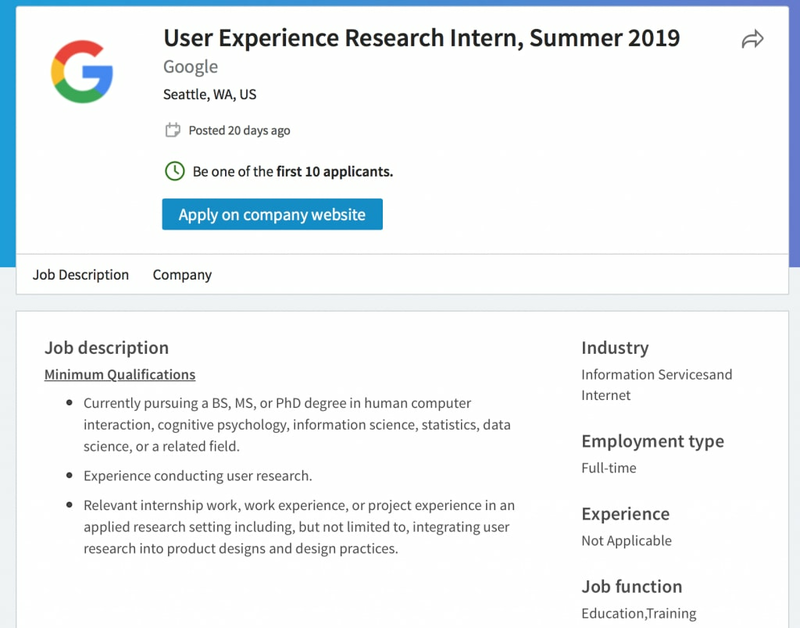 These steps will help prepare you up for the annual UX design internships that come from large companies with well-oiled design departments, such as LinkedIn and Google. 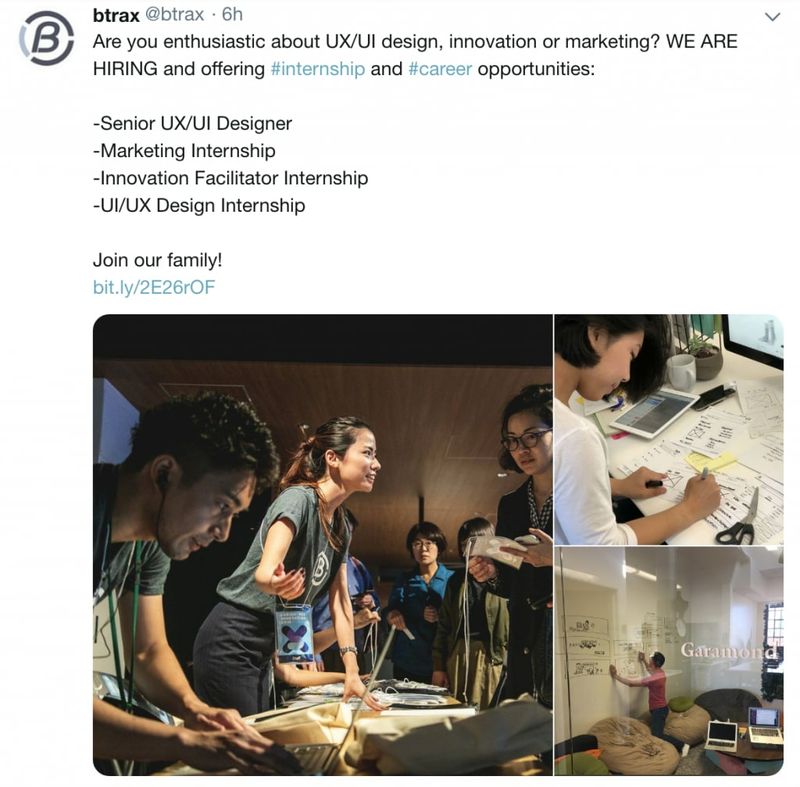 Of course, top digital product design companies such as frog design, IDEO, and Smart Design also open their doors to UX design interns. Here’s an example from frog. 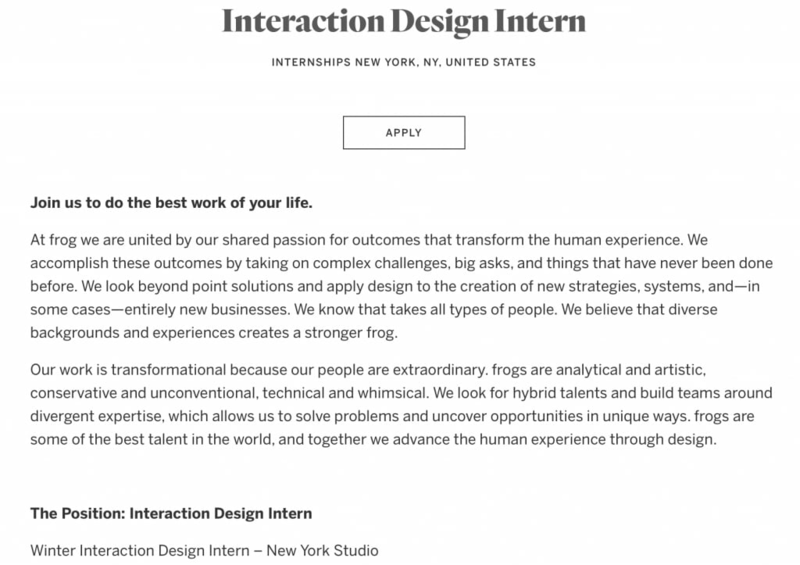 Let’s focus on the specifics of how to get a design internship. 1. Are you looking for a paid or unpaid opportunity? The good news: most internships these days are paid. In 2012, about half of all U.S. internships were unpaid, but that number dropped to 43 percent in 2017, according to the National Association of Colleges and Employers. While unpaid internships lack one serious benefit, they can arm you with relevant experience and help you land a full-time job. Whether they make sense for you is a personal decision you’ll need to make before you begin your search. 2. What kind of company do you want to work for? Design studios: Their focus lies on design, and they work under strict restrictions on budgets and timelines while managing strong design processes to deliver great results. Some examples of design studios include Cooper, Frog, IDEO, and Designit. Product-based companies: Such companies build physical or digital products for both B2C and B2B clients. Product-based ventures run the complete product cycle and have in-house workforces. Examples include Adobe, Apple, Samsung, Google, and Microsoft. Service-based companies: These are businesses that build software for other clients. They take up projects and work to meet the requirements and priorities of their clients. The design process leans more toward client-driven than user-driven. For instance: Accenture, TCS, and Wipro. 3. Which design field do you want an internship in? UX design is a broad field that is continuously evolving. So, you need to focus on a specific area and build your expertise around it. Question yourself about the type of designer you want to be. Decide whether you want to be a UI designer, product designer, interaction designer, or explore some other role. Cultural fit: Every company has its own dynamic culture and employers want to know if you’ll fit in. In this regard, consider whether you can move at the company’s work pace and adapt to its work procedures, among other things. Enthusiasm to learn: Willingness to learn more is attractive to employers, especially as we’re talking about having little practical experience. Your enthusiasm to learn should be reflected in your cover letter. It’s also best when your portfolio captures your zeal and self-awareness. This means that a portfolio that dives into how you plan to do things differently on a design project is better than one that brags about how amazing your design is. Indirect experience: Not having direct workplace experience does not mean that you don’t have relevant experience. You can volunteer in local communities or create a blog (more on this below). Working other jobs—even being a cashier—can also help by enhancing your communication skills, which are a must in the UX design sphere. Communication skills: A rambling cover letter fails to impress your target. Put effort into crafting a sharp, to-the-point cover letter that is free of spelling mistakes, typos, and grammatical errors. Your communication skills also need to show on your portfolio. Problem-solving skills: Solving problems sits at the heart of UX design. And a commonly asked question in an interview enquires about how you dealt with an unexpected situation. In such instances, interviewers aim to learn about how you handle unforeseen turns in the process. Join design communities: Once you start interacting there, you will also learn about UX design events and meetups, which will expand your network further. Plus, you will have the chance to learn from others’ experiences. Go to networking events: Attend networking events that take place in your city. These give you a chance for forming meaningful connections with other designers. You can also learn about designing and get in touch with people who can refer you to design companies. Use LinkedIn for networking: Set up a LinkedIn account or refine it if you already have one and use it to strengthen your professional network. Reach out to recruiters who are hiring and introduce yourself. It’s low-risk and potentially high-reward. Leaving your resume and portfolio without context won’t yield much, though. Instead, introduce yourself and explain how your skills can be a fit for the company. Even if a hiring manager does not have any openings, a good first impression can create an opportunity for you in the future. Other social media channels: Look for the UX designers, agencies, and design studies on social media and interact with them. Several thought leaders share ideas on Twitter, Slideshare, YouTube, and Medium. Especially at this stage, always be learning! This will give you an edge over others, not only when you are searching for an internship but in all of your career stages. Being well-read shows your recruiter that you are intellectually curious, which is a major bonus point in getting your dream UX internship. Online resources: An extensive amount of learning material is available online. There are innumerable helpful blogs. Moreover, free UX design courses (such as those offered by Springboard) prepare you for landing UX design internships and jobs. Offline resources: Libraries still serve as great resources for getting learning material. What’s more, every university has a career center, and you can seek help searching for design internships, readying your cover letter and resume, and preparing for your interview. You can also get guidance from career advisors. Instead, put together a portfolio that easily accessible, navigable, and presentable. Set up your portfolio website with an interesting about page that reflects your personality. A well-designed about page is where most companies start on your portfolio as it sets the tone for the rest of the website and tells UX managers if you are a cultural fit. You don’t have to overload your portfolio with designs. Instead, three to four of your best designs that are put together as easy-to-read case studies can work wonders. Blogging: Writing about UX design is a great way for aspiring UX designers to develop their brand. It shows that you are interested in the field and have knowledge as well. What’s more, blogging demonstrates to the employers that you have a grip on different UX concepts. And a consistently updated blog shows your ability to stick with a project. Hands-on experience with side projects: Now, this might seem like a classic example of the chicken and egg situation. 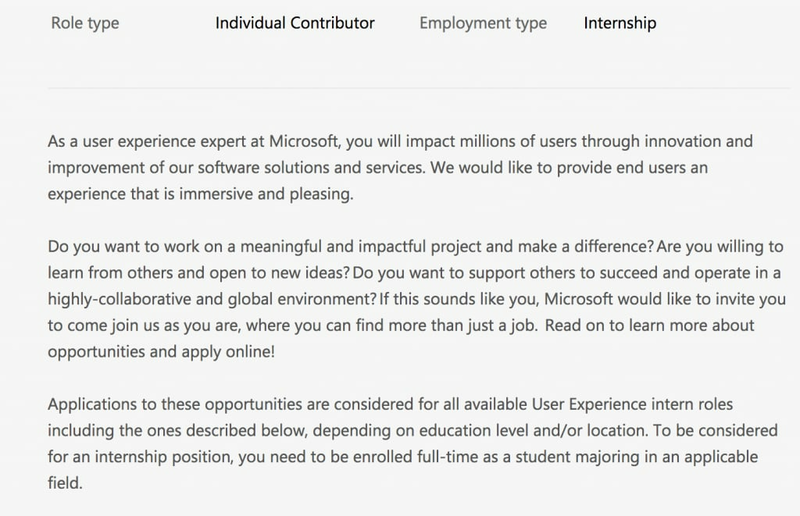 You need experience to land an internship. At the same time, you need an internship to get experience. Start by doing some UX-related volunteer work. Moreover, do some dummy projects for your ideas. Then you can start freelancing. Career fair and local community meetups: Career fairs are places where recruiters from different companies gather with the intention of hiring students. You can easily get in touch with a UX hiring manager and start paving the way for your internship. Similarly, attend UX-related community chats and gatherings. Join Meetup.com and commit to attending at least one gathering each month. Other places where you can look up design internships include The Muse, Glassdoor, and AngelList. It is best to keep track of internships on multiple job boards to make sure that you are coming across all the available opportunities. Company websites: Knowing where you want to intern defines your job search strategy further. Once you do that, you can keep an eye on the company websites. Uberemphasizes opportunities to learn and grow through its program. Reddit is currently building its first intern program for designers. Amazon’s UX design interns are paid, as is the norm among large tech companies, and the company even offers relocation benefits. Salesforce‘s Futureforce University Recruiting program comes with plenty of perks. Summing up, landing a UX design internship does not have to be about throwing darts in the dark. Instead, a well-planned strategy with a good portfolio can set you up for success. Keep applying: Every rejection letter gives you an opportunity to work on what was missing in your attempt. Do your homework: It is essential that you study each organization before you apply for their design internship. This helps you send personalized emails to hirers, which reflects your enthusiasm to learn. Step out of your comfort zone: You should be open to applying even when you think your chances are slim. That’s the exact tip that helped this aspirant land a Google internship. Good luck! And if you want more guidance in developing your UX skills, check out Springboard’s UX Design Course. It’s a self-paced, mentor-led bootcamp that will take you from beginner to building your first UX portfolio.